Bright and shiny . – Dirty wet dog , boats and sailing. I would apologise for my absence from writing and updating the blog except that i have been exceptionally busy here trying to get jobs done in decreasing amounts of daylight and by the end of a usually cold and miserably wet day i haven’t felt much like writing. It isn’t even that i haven’t been writing either as i have been hard at work on 2 projects related to the public work of Dr Jordan Petersen : i have recently taken the online psychometric trait test and been working on both the past-authoring and future-authoring programmes. (links at bottom) When i get more time i will write about both experiences in more detail. Anyway : Today we woke up to a hard frost on the garden and the wooden deck out back was near-lethal having got wet in the previous days rain, not dried off but then froze overnight, i even found that the top layer in the water butts had turned to ice !. It was still a great day to get out into the winter sun and do some work though. Last week i finished the greater part of my winter planting of around a thousand new bulbs and 2 new trees. Most of the bulbs have gone into 2 new planting areas front and back and i have added to a couple of areas that were a bit thin. I have also planted up about 30 or 40 containers which get moved around as i need them. This year i have added a deeper layer of bulbs in some existing sections using bulbs that will come up through the shallower layers later on in the year. The new area of the back (woodland) garden which gets a lot of shade now has at least 4 ‘layers’ or levels of bulbs planted with some giant alliums at the bottom, going through some of the larger narcissi, then a layer of tulips and then crocus. I noticed this morning that one section that gets the midday sun is already showing signs of the crocus pushing through the bark mulch layer. As a side note i also deliberately collect bags and bags of leaf-mold which goes on top of the new planting. 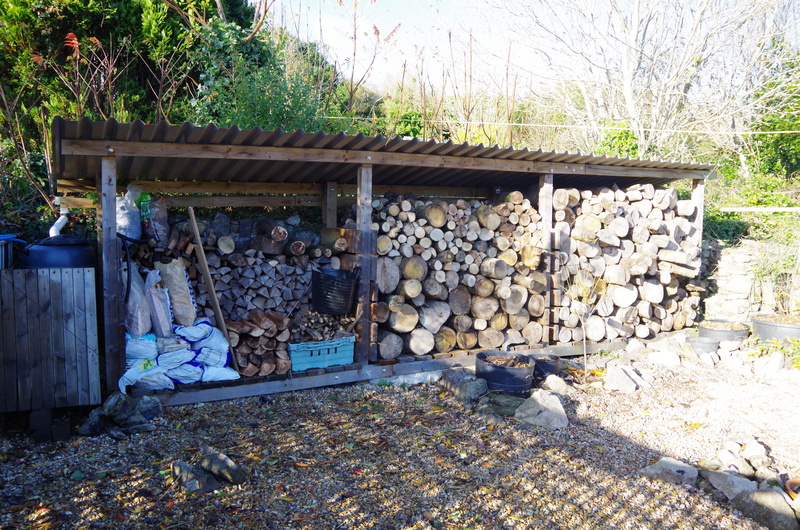 Aside from a lot of planting i had a huge sort out of the woodstore which is now in a logical order of storage and seasoning with ‘ready’ stuff one end and the newest stuff turned and stacked in the far end section. Today in the sun it was really nice work to be cutting and splitting some very wet beech that i won’t be using for at least 3 or 4 years but can season for that long. There is nothing quite as satisfying as swinging a razor-sharp axe after a couple of very frustrating days at work !. Central planting area in back garden done as well. Next job yet to do is to build a partial ‘wave’ fence in the background above because i want to make this garden a lot more private before i build the cabin in there. With the workshop tidy up i then did a whole day just generally tidying the whole site : i also moved water butts and tanks around i ended up with a whole load of junk and debris so half a day was spent just doing a tip run session and burning off semi-rotten old timber . The workshop is just about ready for the bigger projects and we even moved the ‘weights’ bench from the back right around to the front where it will make an excellent low cutting bench for large sheets of plywood. As set up my inside benches are just too small and too high for cutting large pieces and laying-up structural work at the same time. I have been looking for a way to make a temporary workshop extension so that i can do ‘long’ jobs under there…the current limit being about 14 feet and i can see myself laying-up some wooden spars quite soon. All of that has meant that sailing just hasn’t happened as planned. Most days that i did plan to sail were either rain or lots of rain and it just didn’t seem worth the effort to do the 100 mile return trip just to get cold and wet…i can do that in the garden. On the boat i have done the basic set-up for the tillerpilot and played around with a new layout for control lines. Boat itself is good and snug in her mud berth but needs an ‘airing’ visit this week. If all goes well and i GSD here then i will take a day off and go wire up for the tillerpilot. Cold mornings on the river. Previous Chickens, eggs and ultimately omelettes. And I apologise for not visiting over the last few weeks — life gets in the way of simple pleasures sometimes. Wish I had a workshop even half as good as yours — the kitchen table doesn’t cut it and gets me in trouble! Off to read the rest of what I’ve missed.